This is an excerpt from an article originally published in The Root. Read the rest here. If Paris is the City of Lights, then New York is the City of Hustle. Perhaps no other city in the world is so emblematic of competition and drive—the Frank Sinatra-era mantra, “If you can make it here, you can make it anywhere,” indelibly imprinted into the city’s ethos no matter which borough or which avenue you find yourself in or on. Which is what makes it the perfect city for a scam. And what better scam than a good old-fashioned jewel heist? Ocean’s 8, in theaters Friday, takes scamming to the next level, adding another chapter to the Ocean’s franchise, which originated in 1960 with Sinatra as Danny Ocean. Three more Ocean’s films, starting with Ocean’s 11 in 2001, revolved around the debonair Ocean (played by George Clooney) and his motley crew of scammers and con artists, each operating like cogs in a well-oiled machine, to pull off improbable and glamorous scams. Ocean’s 8 riffs on the same formula, this time with Danny’s sister, Debbie, at the center. Around her, a diverse ensemble of women weave their complementary skills together—and though there’s certainly camaraderie in this movie, it’s by no means a buddy film in the way the all-women Ghostbusters reboot was. These are working women, and it’s the big job—and their ability to make scamming look so damn effortless—that unites them. Among the crew is rapper Awkwafina, who plays Constance, a hilarious, street-smart pick pocket who manages to steal a few scenes as well. To her, each of the characters speaks to a different kind of New York experience—and a different brand of hustle. There’s Cate Blanchett, dripping with cool as Lou, Debbie Ocean’s ace. Sarah Paulson’s Tammy parachutes in from the ’burbs, leaving behind a garage packed to the ceiling with stolen merch, while Mindy Kaling’s Amita exudes “over it” as an Indian-American jewel appraiser who weathers deeply personal (this is why you’re not married) criticism from her clients. And, of course, there’s Nine Ball, a hacker played by Rihanna, sporting an impressive cascade of locs. Recently, the pop star’s hairstylist, Yusef Williams, spoke to Refinery29 about how they deliberately shaped the character through her style. “Her locs would maintain that tie to Africa. She’d keep her accent. She wasn’t just going to be some American girl in this movie. Nine Ball is still a Caribbean girl that just happens to be in America,” Williams said. 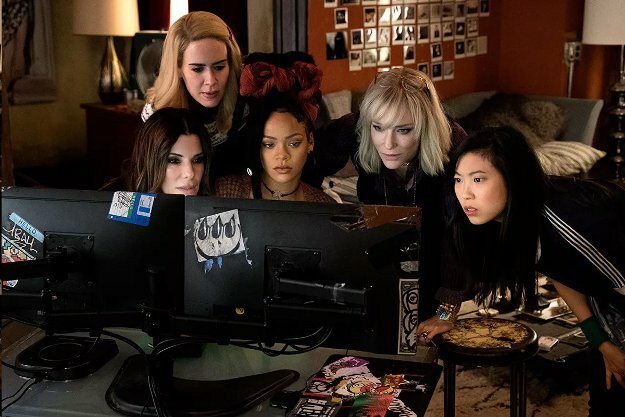 These different ways of being are part of the appeal of the film; not only do the characters represent different backgrounds and lifestyles, but each of the women of Ocean’s 8 dons an array of personas to execute the heist. Given the ways that women are typically typecast in Hollywood’s summer blockbusters, watching each character cycle through different roles—a harried food truck worker in one scene; a socialite dripping in jewels, descending the red-velvet stairs of the Met Gala, the next—is enjoyable and gratifying.